Seattle hot air balloon rides? Have you ever thought of riding in a Seattle hot air balloon? Forget dinner and a movie or going to another musueum. Try something out of the ordinary! I've noticed that with our kids, it's pretty easy for them to have a good time no matter what we're doing. They're happy going to the park and playing on the equipment there. But as kids get older, it can be hard to know what to do with them so that they have a good time while on vacation. Well, if you haven't tried ballooning, now is the time. Seattle is one of the neatest spots to take a hot air balloon ride because everything is so gorgeous. When you're a thousand feet up in the air looking down at all the greenery below, it definitely takes your breath away. So what can you expect if you decide to take to the skies? Well, one of the most common questions people ask is if it is colder in the balloon than on the ground. Surprisingly, it is the same or even warmer. This is because the balloon is traveling with the wind current, and therefore you don't have the wind blowing in your direction. But it's still a good idea to wear pants and closed-toed shoes, simply for the fact that the balloons most often land in fields after the ride and nobody wants to be walking through the field with high heels on, like what I saw at the Seattle Tulip Festival one year. One of the things that people first ask when considering a ride in a hot air balloon is, "How safe are the balloons?" Well, Seattle hot air balloon rides have come a long way since a duck, rooster, and sheep were the first passengers to ride in a balloon in 1973. Ballooning is one of the safest "rides" you can take and one reason is that you're usually high enough not to have to worry about anything like trees or buildings, and you're low enough not to have to worry about any other type of flying aircraft. You're not competing with anyone for space, like we do every day in a car. 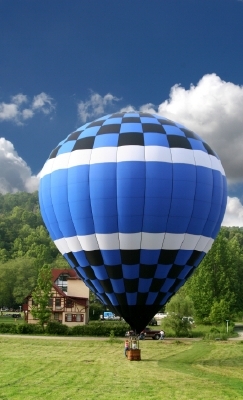 Also, most hot air balloon companies use FAA-licensed pilots, along with certified balloons. I would recommend that when you're looking at any Seattle hot air balloon company, you make sure that they comply with these two requirements. It still takes a lot of knowledge, skill, and practice to be able to fly one of these balloons and what better person to do that than someone who is certified. So now that you're anxious to try a hot air balloon ride, where do you go? Well, there are a couple of companies in the Seattle area that I know about that you might want to check out. Return from Seattle Hot Air Balloon Rides back to Seattle Attractions. También puede leer esta página en español: Aerostato en Seattle.